On our last day of the expedition, we drove to the Jozani rain forest and have a walking tour of medical botany. The rain forest is such an important part of our medicines and ecosystem. 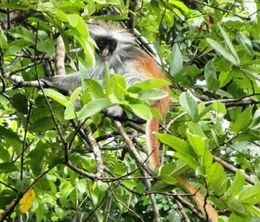 We see the Colobus red monkeys. They allow us to get fairly close to them. Our guide says, “It’s because we treat them with love”. It is a fantastic way to end this expedition with such a simple sentiment. The expedition was a success in that as a group we saw firsthand many tropical diseases and we learned more about Africa and their health care delivery then we had hoped and even learned about each other’s health care in our respective countries; it was exactly what we had sought. Our group was wonderful and diverse and as they say frequently in Africa, “We leave as friends”. Africa is a contrast in so many ways. Between the most amazing landscapes I have ever seen to the poverty and disease to the resilience of the people and joy of the children in the smallest of things. I leave Africa with the hope of returning one day; my clinical knowledge of tropical medicine improved but even better my soul more fulfilled. Africa is truly amazing.